Russia's space chief exhorted Washington on Thursday to help finance the construction of extra Russian spacecraft needed to run the international space station during a break in U.S. shuttle flights. Pending an inquiry into the Columbia shuttle disaster, Russia's Soyuz crew capsules and Progress cargo ships are the only links to the space station. Russian space officials said they were ready to build extra ships - but they want the United States and other partners in the 16-nation project to share the costs. But NASA has said potential funding to Russia is constrained by U.S. legislation, which Russian Aerospace Agency director Yuri Koptev urged the Bush administration to overlook. "We expect that the spirit of our relationship that has emerged from our nations' fight against international terrorism will be applied to this specific and very important area," he said Thursday at a news conference. The Iran Nonproliferation Act of 2000 bars "extraordinary payments" to Russia's space agency for the station unless the United States confirms Russia has not transferred missile technology or nuclear, chemical or biological weapons to Iran in the previous year. The legislation reflects strong U.S. concerns that Russia's ties with Iran are helping the Islamic republic advance its nuclear and missile programs. Russia says its nuclear cooperation with Iran is strictly limited to a contract for building a civilian nuclear power plant in Bushehr and denies any leaks of missile technology. On Thursday, the space chief dismissed U.S. accusations of cooperation with Iran as "political myths" and urged the Bush administration to seek a waiver of the nonproliferation act. Koptev said his agency and NASA were also talking to European participants in the space station about possible funding for extra Russian ships. 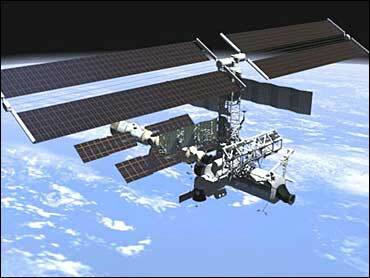 The space station usually has a permanent staff of three - currently, two American astronauts and a Russian cosmonaut. But Koptev said a replacement crew to be sent in May aboard a Russian Soyuz would most likely be only two people, which would reduce the number of trips to the station needed to sustain them. Space officials had discussed sending a replacement crew in late April, but Koptev said the Soyuz would not be ready until early May. Russia has budgeted $130 million to fulfill its obligation to send two Soyuz and three Progress ships to the station this year. But it needs an additional $85 million to finish construction of two Soyuz capsules and six Progress ships needed because of the break in shuttle flights. Koptev warned that Russia cannot finance the project alone, and that Russia's partners must move quickly to help. "If we don't make a decision today on building a certain number of ships and provide the necessary funds, we can say for sure that we won't have the necessary number of ships next year," he said.